Prepare for the race of a lifetime! Deck-building – Choose your course upriver! This will determine which cards you may add to your swimming deck. Enhance your swimming ability by gaining the most powerful swim cards! Player Interaction – Acquire cards to unleash hungry bears and eagles on your opponent’s salmon! Unlock the power of the river’s raging rapids and strong currents! Fatigue – Avoid overexertion, as this leads to the build-up of fatigue, which will slow you down! Modular boards – Experience a new river each game! The river’s difficulty and length can be customized to your liking! 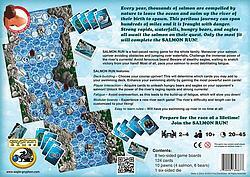 Easy to learn rules – will have you swimming up river in no time at all!